The election for Congress was seen as safe for Democratic 9 term incumbent William Jefferson in a district that mostly covered New Orleans. But the Republican narrowly defeated him in an upset. The investigation began in mid-2005, after an investor alleged $400,000 in bribes were paid through a company maintained in the name of his spouse and children. The money came from a tech company named iGate, Inc. of Louisville, Kentucky, and in return, it is alleged, Jefferson would help iGate's business. Jefferson was to persuade the U.S. Army to test iGate's broadband two-way technology and other iGate products; use his efforts to influence high-ranking officials in Nigeria, Ghana, and Cameroon; and meet with personnel of the Export-Import Bank of the United States, in order to facilitate potential financing for iGate business deals in those countries. On 30 July 2005, Jefferson was videotaped by the FBI receiving $100,000 worth of $100 bills in a leather briefcase at the Ritz-Carlton hotel in Arlington, Virginia. Jefferson told an investor, Lori Mody, who was wearing a wire, that he would need to give Nigerian Vice President Atiku Abubakar $500,000 "as a motivating factor" to make sure they obtained contracts for iGate and Mody's company in Nigeria. A few days later, on 3 August 2005, FBI agents raided Jefferson's home in Northeast Washington and, as noted in an 83-page affidavit filed to support a subsequent raid on his Congressional office, "found $90,000 of the cash in the freezer, in $10,000 increments wrapped in aluminum foil and stuffed inside frozen-food containers." Serial numbers found on the currency in the freezer matched serial numbers of funds given by the FBI to their informant. Late on the night of 20 May 2006, FBI agents executed a search warrant at Jefferson's office in the Rayburn House Office Building. This is "believed to be the first-ever FBI raid on a Congressional office," raising concerns that it could "set a dangerous precedent that could be used by future administrations to intimidate or harass a supposedly coequal branch of the government." The FBI videotaped Jefferson receiving a stock certificate from Mody for a company set up in Nigeria to promote iGate's technology. Jefferson predicted the deal would generate $200 million annually after five years. Jefferson told Mody that he wanted a similar financial stake in the business in Ghana. Jefferson sought $10 million in financing from Mody to take over iGate and install "confidants" on the new board. In two payments, Mody wired $89,225 to the ANJ Group LLC, a company controlled by Jefferson's family. Jefferson lent $4,800 of the money Mody gave him to an unnamed congressional aide. Another $4,900 was given back to the FBI by one of Jefferson's attorneys. The FBI claims it has uncovered "at least seven other schemes in which Jefferson sought things of value in return for his official acts." 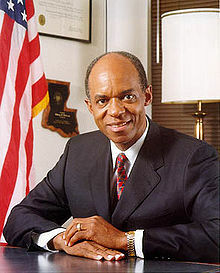 Incumbent U.S. Representative William J. Jefferson won the Democratic primaries in Fall 2008. Jefferson had weathered a major challenge in the Louisiana 2nd congressional district election, 2006, when voters had fresh on their minds allegations that the representative had inappropriately used the services of a Louisiana Army National Guard unit in accessing his house during the aftermath of Hurricane Katrina. By fall 2008 the incumbent faced longstanding federal charges of bribery involving Nigerian business interests and was perceived by some as vulnerable, with only 25 percent of Democrats voting for him in the first round of the 2008 Democratic primaries. Jefferson faced six African-American challengers along with newscaster Helena Moreno in the first primary, all of them clamoring for change from Louisiana's reputation for political corruption. Jefferson defeated Moreno by 57 percent to 43 percent in a runoff which went largely along racial lines. Moreno later endorsed Cao in the general election. Cao, unopposed for the Republican nomination, was running against Jefferson, as were Green Party candidate Malik Rahim and Libertarian Party candidate Gregory Kahn. An earlier candidate, independent Jerry Jacobs, had withdrawn. On November 30 the New Orleans Times-Picayune editorially endorsed Cao while on the op-ed page its columnist James Gill asserted that Jefferson's reelection "is not going to happen." The prospect of a serious general election in the majority African-American and heavily Democratic 2nd district was all the more startling in that the last Republican to represent the district was Hamilton D. Coleman, who left the office in 1891. According to the Los Angeles Times, Cao, if elected, would become the first individual of Vietnamese extraction to serve in the U.S. Congress. Cao's candidacy received the endorsement of the Alliance for Good Government, the Family Research Council's Action PAC, Louisiana Governor Bobby Jindal, and even entertainer Pat Boone. New Orleans Mayor Ray Nagin had announced his support for Jefferson during the Democratic primary elections. The New Orleans Gambit Weekly, citing its opposition to Jefferson's alleged corruption and Cao's noncommittal statements on embryonic stem-cell research, made no endorsement. The days before the December 6 election were characterized by what Jefferson's campaign called "overly negative" tactics undertaken on behalf of Cao's campaign by outside organizations such as the National Republican Congressional Committee. Besides references to Jefferson's removal from the House Ways and Means Committee by Democratic Speaker of the House Nancy Pelosi, the negative tactics included automated telephone calls from a woman identifying herself as "Katy" and citing incumbent Jefferson's federal indictment on 16 counts of corruption. In a meeting of African-American ministers, the Reverend Samuel Butler said that the real reason for the negative campaign tactics was to disenfranchise African-American voters, which prompted Cao advisor and former New Orleans City Council member Bryan Wagner to assert that, "with Rev. Butler's imagination, he may want to go to work for Walt Disney." On December 6, the Times-Picayune reiterated its endorsement of Cao, this time pointing to President-Elect Barack Obama's efforts on behalf of Democrat Paul Carmouche in the simultaneous election in Louisiana's 4th congressional district and Obama's non-involvement in efforts to support Jefferson. On December 6 at 10:20 PM CST, CNN projected Cao the winner. Final unofficial results on the Louisiana Secretary of State's web site showed Cao with 33,122 (49.55%), Jefferson 31,296 (46.82%), Kahn 548 (0.82%), and Rahim 1,880 (2.81%). Jefferson won by 23,197 to 20,246 in Orleans Parish, where 21 of the 392 precincts showed zero votes for Cao, but Cao more than made up the difference with a margin 12,696 to the incumbent's 8,099 in Jefferson Parish. ^ "BUSINESSMAN PLEADS GUILTY TO PAYING BRIBES TO U.S. CONGRESSMAN" (Press release). Federal Bureau of Investigation. 2006-05-03. Retrieved 2007-02-06. ^ Barakat, Matthew (2006-05-21). "Filing: Tape Shows Lawmaker Taking Money". Associated Press. ^ Lengel, Allan (2006-05-21). "FBI Says Jefferson Was Filmed Taking Cash". Washington Post. p. A01. Retrieved 2007-02-07. ^ Bresnahan, John (2006-05-21). "FBI Raid Angers Some on Hill; Feds Probe Additional Jefferson 'Schemes'". RollCall. Archived from the original on 2012-06-29. Retrieved 2007-02-06. ^ Hulse, Carl (2006-05-24). "F.B.I. Raid Divides G.O.P. Lawmakers and White House". New York Times. p. A01. Retrieved 2007-02-07. ^ "Katrina: Louisiana Congressman William Jefferson Used National Guard to Retrieve Belongings" by James Joyner. ^ Michelle Krupa, "Newcomer Hopes to Unseat Jefferson: Republican Lawyer Vows to Restore Ethics," Times-Picayune (New Orleans), 2008 December 1, pp. A1, A4. Most of the print article is at http://www.nola.com/timespic/stories/index.ssf?/base/news-12/1228112427291090.xml&coll=1 Archived 2008-12-10 at the Wayback Machine (accessed 2008 December 1). ^ Los Angeles Times article on the 2008 December 6 New Orleans election. ^ Alliance for Good Government endorsement of Joseph Cao. ^ In the last days of the campaign Democrats Helena Moreno, who was defeated by Jefferson in the Democratic primary, and former District Attorney Harry Connick, the father of singer Harry Connick, Jr., endorsed Cao and recorded telephone messages to be played to voters. Michelle Krupa and Frank Donze's "Crooning for Cao" Archived 2008-12-20 at the Wayback Machine in the Times-Picayune, 2008 December 4, retrieved 2008 December 6. ^ For Congress: No Endorsement. ^ "Why Today's Election Matters" (editorial), Times-Picayune (New Orleans), 2008 December 6, p. B4, available at http://www.nola.com/timespic/stories/index.ssf?/base/news-5/1228544712295490.xml&coll=1 Archived 2008-12-10 at the Wayback Machine retrieved 2008 December 6. ^ "Local and National Election Results - Election Center 2008 - Elections & Politics from CNN.com". CNN. Retrieved May 11, 2010. ^ http://www400.sos.louisiana.gov:8090/cgibin/?rqstyp=elcms2&rqsdta=120608[permanent dead link] accessed 2008 December 6 at 11:00 PM CST.